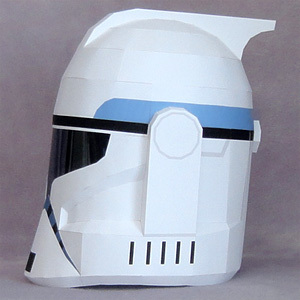 Papercraft de Clone Troopers - Manualidades a Raudales. Papercraft imprimible y armable de Clone Troopers de la saga Star Wars, para hcerla hay que ayudarse de las fotografías porque no dispones de instrucciones, podéis descargar y ver gratis muchas más manualidades recortables de Star Wars y otros personajes famosos haciendo click Aquí, esperamos que os gusten y que nos mandéis vuestros comentarios y fotografías de vuestros trabajos. También podéis seguirnos haciendo click en el Me Gusta de nuestra página de Facebook. Star Wars – Clone Troopers. 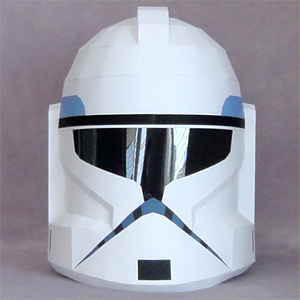 Papercraft de un Clone Troopers de Star Wars. Los Clone Troopers o Soldados Clones del Gran Ejército de la República son los soldados en el universo ficticio de Star Wars, clonado a partir de Jango Fett, un cazarrecompensas con armadura Mandaloriana. Aparecieron por primera vez en Star Wars Episodio II: El Ataque de los Clones, y reaparecen en Star Wars Episodio III: La Venganza de los Sith, donde son interpretados por Temuera Morrison. En los dos programas de televisión, que son la voz de André Sogliuzzo y Dee Bradley Baker. En estas películas, soldados clon componían el grueso del Ejército de la República durante las Guerras Clon. Se presenta como la parte principal de las fuerzas armadas de la República Galáctica en sus últimos años, convirtiéndose en uno de los ejércitos más grandes jamás reunido, aunque superado por Ejército Droide Separatista. Después de las Guerras Clon, que fue el núcleo de las fuerzas armadas del Imperio Galáctico, siendo ellos los Stormtroopers. Ellos usaron rifles Blaster y Z6 armas cadena. Fuente: Wikipedia y http://www.hyakunin.com/. The clone troopers of the Grand Army of the Republic are fictional soldiers in the Star Wars franchise, cloned from Jango Fett, aMandalorian bounty hunter. They first appeared in Star Wars Episode II: Attack of the Clones, and returned in Star Wars Episode III: Revenge of the Sith where they were played primarily by Temuera Morrison. In the two Clone Wars animated television series, they are voiced by Andre Sogliuzzo and Dee Bradley Baker. 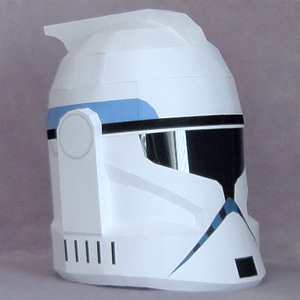 Clone troopers formed the bulk of the Army of the Republic during the Clone Wars. They are depicted as the main part of the armed forces of the Galactic Republic in its final years, becoming one of the largest armies ever assembled, only surpassed by the Separatist Droid Army. Nearing the end of the Clone Wars, through a subliminal command known as «Order 66», the Clone Troopers turned on the Jedi and slaughtered most of them. After the Clone Wars, the Clone Troopers served as the nucleus for the armed forces of the Galactic Empire, eventually becoming the first Imperial Stormtroopers. Later on the clone homeworld of Kamino, the Kaminoans made clones to fight the Imperial clones and The Empire. When the rebellion of clones was crushed The Emperor ended the cloning due to the tendency of the clones to turn on their leader. The clones were then replaced by «volunteers», but the clones that were already in the army were allowed to stay in the Imperial Army. Wikipedia and http://www.hyakunin.com/.